Information Literacy Weblog: Belated Merry Christmas! Sorry for the lack of posts over the last few days. I am finishing the year with a nasty cold/flu - feeling dreadful for nearly a week now. Fortunately I'm not chief cook over Christmas! 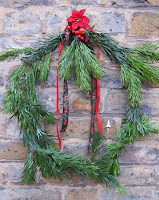 Anyway, starting to feel a little bit better, so here are slightly belated Christmas greetings to all blog readers!